It might not have been the best idea, given that he was attending a promotional event for FC Barcelona, but Swedish actor Alexander Skarsgard didn’t show up wearing the famed purply-blue and red uniform of the Catalan champions. 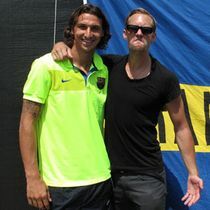 Alexander Skarsgård with Swedish football player Zlatan Ibrahimovic, who also plays for Barcelona. Skarsgard was wearing green and white, instead – a Hammarby jersey. As he explained this, there was a chorus of boos from the spectators in the Nike Ricardo Montalban theater in Los Angeles. The audience was all about Barcelona, and they had little tolerance for any divided loyalty. Skarsgard tried to explain. He mentioned that as a Swede, he was excited to be there to support Zlatan Ibrahimovic, the Swedish player recently signed by FC Barcelona. The crowd hesitated, unsure what to make of such a withering description of a club by an alleged fan. A few cheers went up at this, but most people were taken aback, or perhaps feeling sympathetic for Skarsgard. When the host of the celebrity segment mentioned in a commercially pandering segue that Hammarby was sponsored by Nike, and could perhaps improve, seeing how Nike sponsored a winner like Barcelona, Skarsgard shook his head vehemently. At this point, most in the room decided Skarsgard was joking, and chose to laugh along. One thing Skarsgard never said, however, was that he would give up being a Hammarby fan. Loving a winner is easy, and Barcelona has had droves of fans following their every move even before they conquered the stunning treble of wins this past season. The FC Barcelona players don’t need to sign autographs until their feet are sore; they don’t need to take time out of their day to talk to local press after their practices; they don’t need to fly coach or stay at budget lodgings. So they don’t, for the most part, do any of those things. Really, Barcelona doesn’t have to win Skarsgard over – the club doesn’t really need new fans. They have plenty of them already and collect more with every victory. The glamor of the sport lies in clubs like Barcelona, who engrave their names on the big events, but the heart and soul of the game lies in clubs like Hammarby and the loyal fans that support these smaller organizations, far from the red carpets and the glittery reflections from multiple trophies. Soccer would not be played all around the world if people just turned on their televisions to watch the big clubs play. The sport’s growth and longevity has often rested on the tribal aspects of a club representing a community. Those communities also serve as the cradle for developing players. Right on, once a Bajenfan always a Bajenfan, Forza Bajen…. one life, one team… allways Hammarby! I just read he was there with Evan Rachael Wood who is playing the Vampire Queen on TB? Thought she was with Shane West.